[Antibore’s] friend was just wrapping up his Ph.D. Degree and he wanted to build him something special to commemorate the accomplishment. After thinking about it awhile, he realized that his friend was quite gregarious and known to make off-the-wall comments at parties and such. A ton of these one-liners were documented on video over a span of 10 years, so [Antibore] got the idea to make his friend a soundboard featuring his own witticisms. He found a breakout board capable of playing back OGG files and got to work loading it up with his friend’s random sayings. The board was connected to a small amplifier and speaker, then everything was installed into a black plastic case. 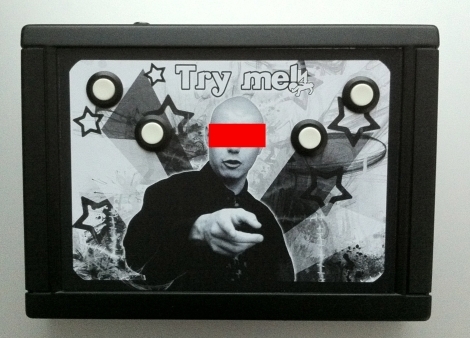 Four arcade-style buttons were mounted on the front of the case, along with a picture of his friend. Up to 16 different sayings can be played, depending on which combination of buttons are being held at a particular time. It’s sounds like a really cool project, and certainly makes for a one of a kind gift. Currently there is no video or audio of the box in action, but here’s hoping we’ll see some soon. 4 buttons? so 2^4 = 16. But how can you press the combination of pressing no buttons at all? @UserName – Good point, there’s only 15 clips =) Updated post. UserName is right. The article even says there are 15 unique samples. where keys is a value between 1-15, char representing the input of the 4 buttons. 0 being non pressed. I did the super-cheapskate version of this a while back with an ISD chip — purchased under-the-radar on a larger order, a PC speaker — “salvaged”, a mini-breadboard, a cardboard business card box — for resonance, and a Radio Shack PIR detector. Since there was no controller used, the sound played twice — with a little delay — on each trigger of the PIR (detect and ‘clear’). To keep from being startled by visitors, I mounted the thing at the entry to our office ‘bull pen’, and made virtue of the double-triggering of the PIR by using a ST:TOS pocket door sound. Once for ‘open’, once for ‘close’. I’ve got to assume that ISD has made some progress in the years, and might be an interesting alternative architecture for this sort of project. Is it possible to reverse engineer one of those ‘Mr T in my pocket things’ to accept your own custom audio soundbites? I tried to do it a while ago, but couldn’t turn anything up on the board, what format the sounds were in, or how you would load custom audio onto the boards. Any ideas? Just a nitpick – Ogg isn’t an acronym, so don’t upper-case all of its letters.